In this disc assembly the disc bursts into a chamber with 6 vents dissipating discharge; on surface equipment this protects employees. Each of the discs is supplied with a test burst certificate of conformity. 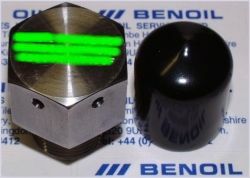 To protect the threads from damage during transport, a protective cap covers the threads. Each unit is supplied in its own individually labelled box. Construction: in terms of materials the foil and the main body unit are typically Monel 400 or Inconel 600 and Stainless Steel respectively. However other materials and grades are available. 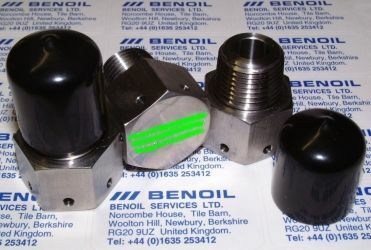 Depending on customer requirements, the units can be engraved with whatever detail is required. Engraved on the body is the design use temperature marked in °F or °C and its burst pressure rating in psi.